Professor of chemical and biomolecular engineering Simon Rogers, left, postdoctoral researchers Jun Pong Park and Yongbeom Seo and professor of chemical and biomolecular engineering Hyunjoon Kong led an international team that developed hydrogen peroxide-bubbling microparticles that may help eradicate dangerous biofilms. CHAMPAIGN, Ill. — Stiff microbial films often coat medical devices, household items and infrastructure such as the inside of water supply pipes, and can lead to dangerous infections. Researchers have developed a system that harnesses the power of bubbles to propel tiny particles through the surfaces of these tough films and deliver an antiseptic deathblow to the microbes living inside. Biofilms are slimy colonies of microbes held together by internal scaffolds, clinging to anything they touch. About 80 percent of all medical infections originate from biofilms that invade the inner workings of hospital devices and implants inside patients. Eradication is difficult because traditional disinfectants and antibiotics cannot effectively penetrate a biofilm’s tough surface, the researchers said. In the journal ACS Applied Materials and Interfaces, a team led by researchers at the University of Illinois at Urbana-Champaign describes how they used diatoms – the tiny skeletons of algae – loaded with an oxygen-generating chemical to destroy microbes. Looking to nature and basic mechanics for a solution, the researchers developed a system that uses naturally abundant diatoms along with hydrogen peroxide and tiny oxygen-generating sheets of the compound manganese oxide. The chemical reaction between the hydrogen peroxide and manganese oxide nanosheets takes place within the empty space inside the diatom. The result is a flourish of microbubbles that flow through the tiny channel, propelling the rigid diatoms forward with enough force to break up the surface and internal structure of the biofilms, the researchers said. The researchers believe that their success is a result of a decision to focus on the mechanical aspects of biofilm destruction, not the chemical aspects of simply killing microbes. 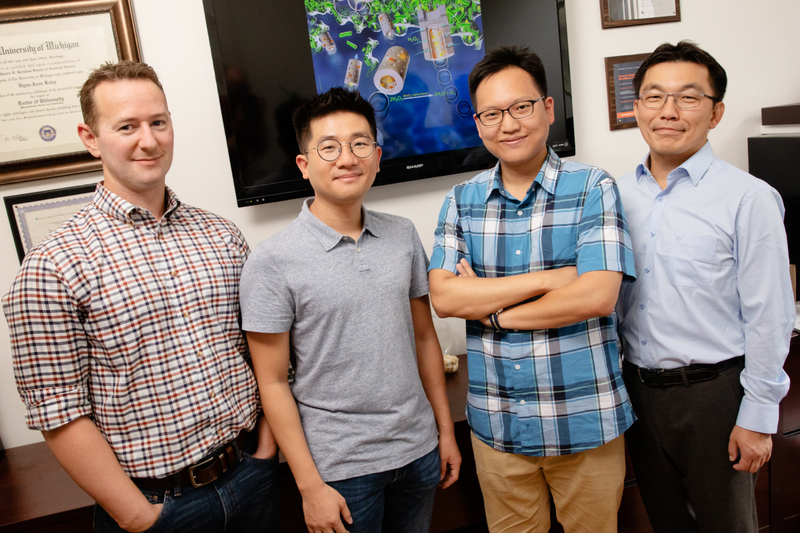 U. of I. researchers Jiayu Leong, Jun Dong Park, Yu-Tong Hong, Yu-Heng Deng, Vitaliy Dushnov and Joonghui Soh also contributed to this study. Additional co-authors include Sang-Hyon Chu of the National Institute of Aerospace, Cheol Park of the NASA Langley Research Center, Dong Hyun Kim of the Korea Institute of Industrial Technology and Yi Yan-Yang of the Institute of Bioengineering and Nanotechnology in Singapore. The National Institutes of Health, the National Science Foundation and the Korea Institute of Industrial Technology supported this research. To reach Hyunjoon Kong, call 217-333-1178; hjkong@illinois.edu.